The city of Seattle/King County has a homeless crisis that bureaucrats perpetuate by coddling criminal activities committed by the homeless. Law-abiding citizens are terrorized by these actions: Feces and urine line Seattle streets along with drug needles all over the place. Mentally unstable people are allowed to roam the streets and scare citizens. The mayor of Seattle, Jenny Durkan, the Seattle City Council and King County bureaucrats are to blame. They take MILLIONS of taxpayer dollars to “solve” the homeless crisis yet do NOTHING to actually solve the problem. In an effort to help a violent homeless criminal, bureaucrats believed that he would turn his life around if just given the chance. Never mind the fact that he was deemed likely to commit a violent offense. From MyNorthwest.com: A violent, homeless man with a long criminal record is on the loose, this time, after allegedly stealing a safe from an apartment complex in South Lake Union, nearly $2,500 worth of goods from a local clothing shop, and a woman’s bike and bank card. He’s already being investigated for stabbing a man. The King County Prosecuting Attorney’s Office says the parties, including the judge, agreed to release Acosta so that he could participate in outpatient treatment that would be monitored by the court, however. Acosta didn’t appear at a recent court hearing and the judge issued a bench warrant for his arrest, according to the Prosecutor’s Office. Acosta, 27, has a long criminal history that includes felony theft and assault in the 2nd degree. In all, he has had six warrants for his arrest since 2014. The most recent incidents happened within days of each other. On July 22, 2018, surveillance allegedly shows Acosta allegedly breaking into a Seattle apartment complex where he pried his way through at least four locked locations, stealing a laptop, key fobs that allow entry into the apartment complex, and a safe holding rent checks (mine included). When officers were dispatched to the location, they immediately recognized Acosta on the surveillance video, according to a police document. Just three days later, on July 25, Acosta and a second unidentified man, allegedly broke into a Seattle clothing store, stole several backpacks and clothes retailing nearly $2,500. Again, when officers viewed surveillance footage, they immediately identified one of the suspects as Acosta, according to the police document. Then, on August 2, Acosta fled from cops after they caught him riding without a helmet. The bike — and the bank card, ORCA card, and movie pass he had in his possession — did not belong to him, according to court documents. Indeed, the cards are from a suspected car prowl and the bike stolen from an apartment garage. Acosta lists a homeless shelter as his residence. There’s been a rash of crime committed by homeless people, sometimes to fuel their drug addiction. Apparently the prosecutor decided it was a good idea to recommend Acosta for the outpatient program because he hadn’t been convicted of a violent crime. 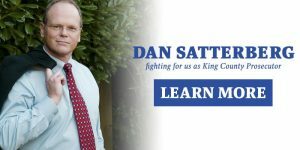 PS: Don’t expect this to be an isolated incident: Satterberg is running for re-election unopposed as his challenger dropped out of the race last week due to medical reasons. This entry was posted in crime, Insanity, Liberals/Democrats/Left, social justice warriors/SJW, Taxes, United States and tagged 2nd degree assault, arrest warrants, Dan Satterberg, felony theft, homeless industrial complex, King County, King County Adult Drug Diversion Court, King County homeless crisis, King County Prosecutor, outpatient treatment, Seattle, Seattle City Council, Seattle Police, Seattle's homeless crisis, stabbing, theft, Washington State. Bookmark the permalink. I read this stuff and am stunned that elected officials not only can’t or won’t fix these problems they exacerbate them, and then want more taxpayer money because what they’ve already spent isn’t enough. Liberalism truly is a mental disorder. For those interested please visit this blog, The Blog Quixotic. They, very thoroughly, outline the homelessness problems in Seattle and the relationships between those paid to solve it. I don’t know who the blog is run by (other than his name). Yet this person is doing the job that most local media won’t do. They outline the concept of “social desirability bias” wherein an agency under reports bad behaviors (as I suggested above) for a specific response and how this diversion program for criminals works to their advantage – one of their desired social bias outcomes. It’s quite telling.